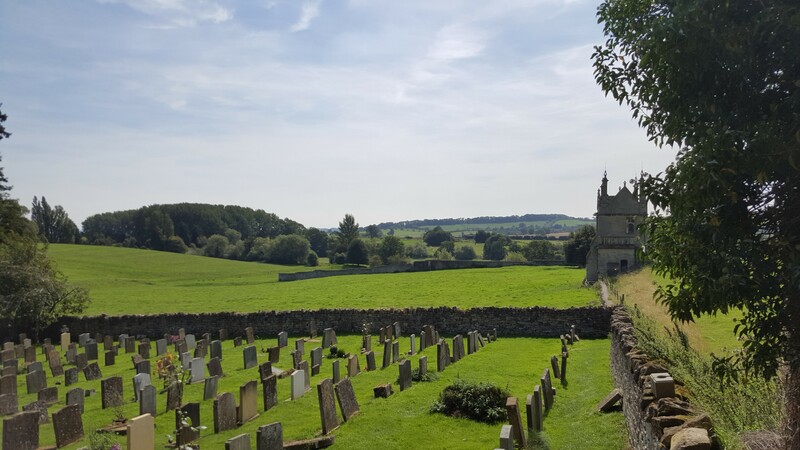 Saturday August 26…Our first full day in the Cotswolds… and the weather here continues beautifully sunny, in a word, perfect! 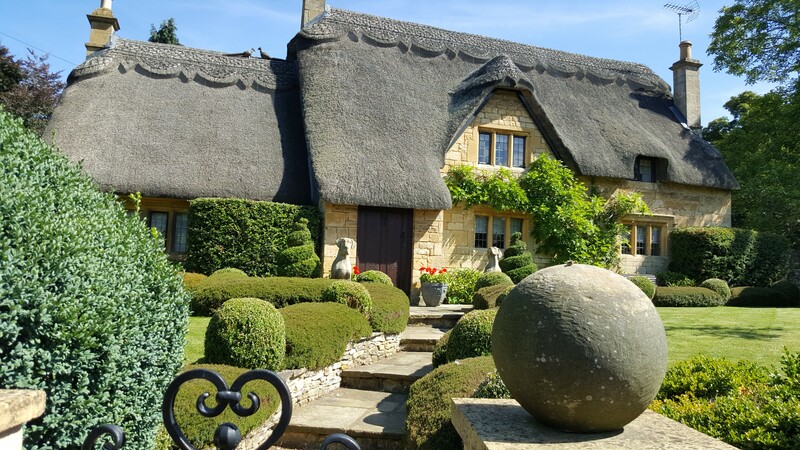 Once we got ourselves out of our respective beds at Old Orchard, and puttered around the house and the grounds (finding out that the toilet in the potting shed was Royal Doulton – talk about keeping up appearances! ), we walked into Broadway. The road from Old Orchard to Broadway was fairly narrow, often with little space to leap out of the way of cars whose drivers apparently thought they were auditioning for the Grand Prix…but we were none the worse for wear despite a few nettles getting in our way. 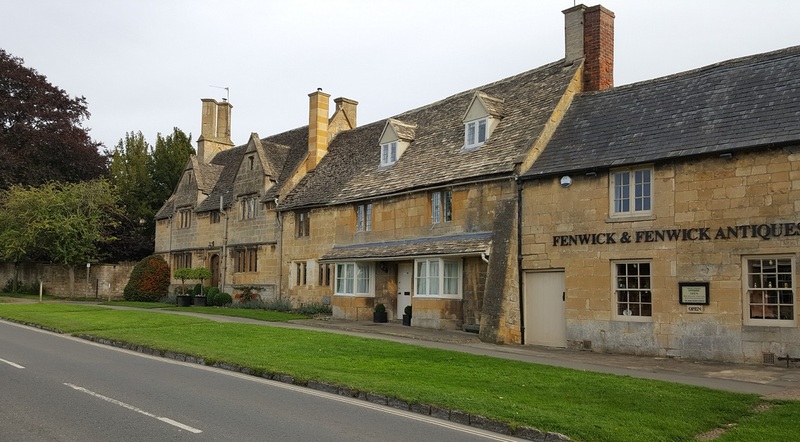 And just looking at the old houses lining the road, or over hedgerows to fields that ranged far and wide was such pleasure, it was worth a little scramble or two. 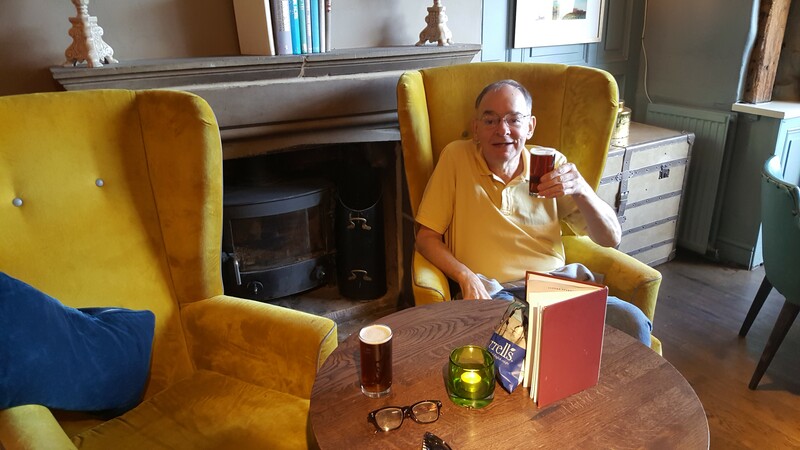 We went for a lazy ramble along Broadway’s high street, stopping in the Swan for half a pint of the local IPA, called Ubu (don’t ask me why the name, but it was absolutely delicious) and some lunch (yummy as well). 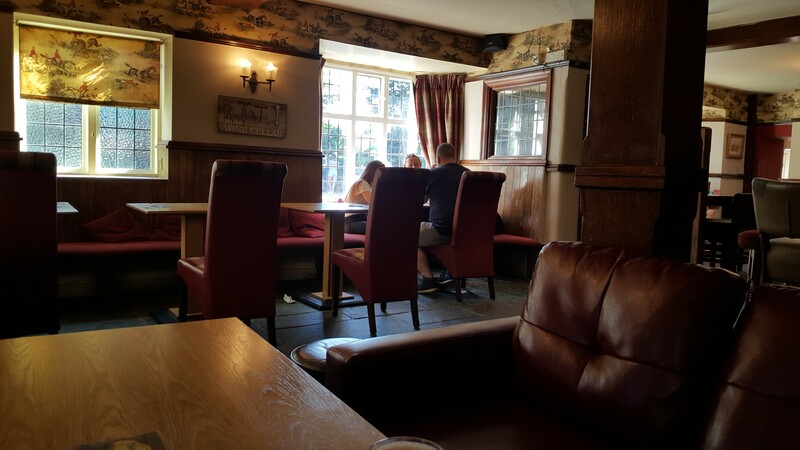 I love the Swan…it is English to the core, and having a drink there is very enjoyable, as is people watching! 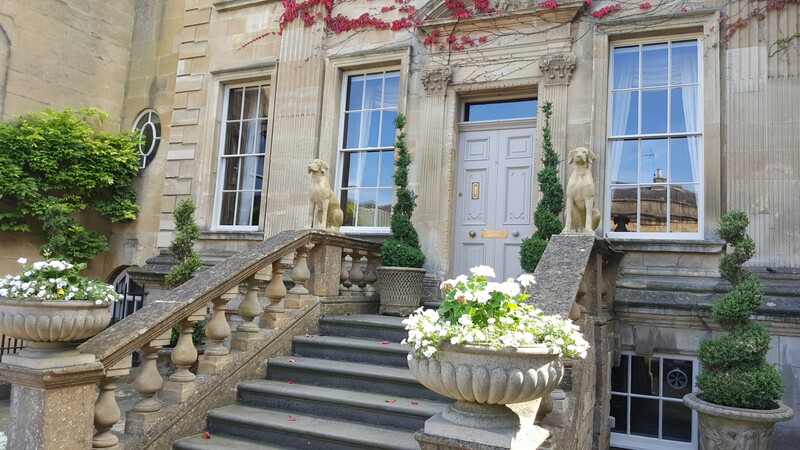 One of the great things I noted in all these small Cotswolds towns – and other parts of England as well – is how welcome – and how well behaved – dogs are, in restaurants and pubs. Dishes of water were set outside shops – no dog ever goes thirsty! 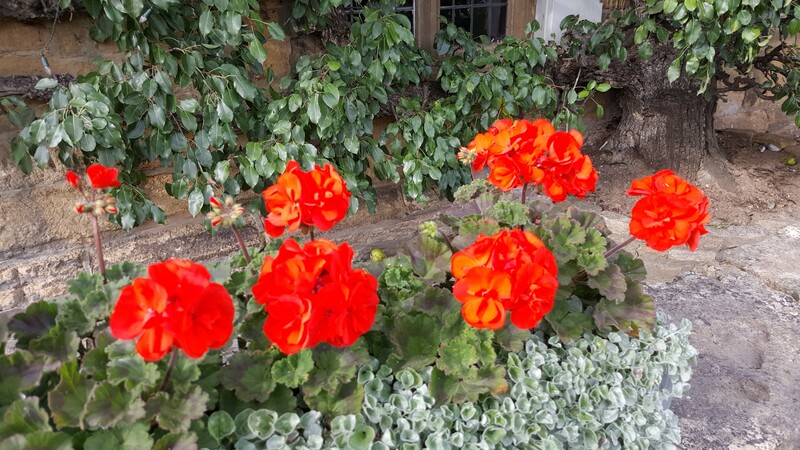 The flowers were in full bloom, and were brilliant – as that part of the street lined with pots of the most vivid red geraniums attested. 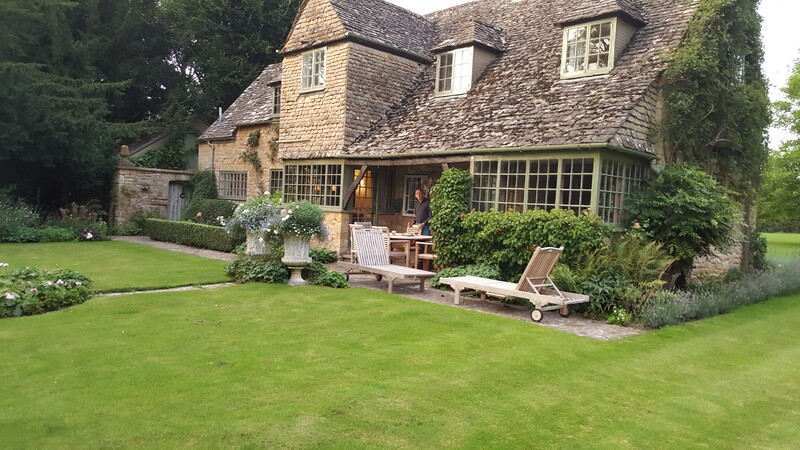 We were fascinated by the architecture, which used mostly Cotswolds stone that gives off that buttery glow even when the sun isn’t shining. I don’t care if it is “tourist-y” – I love it! 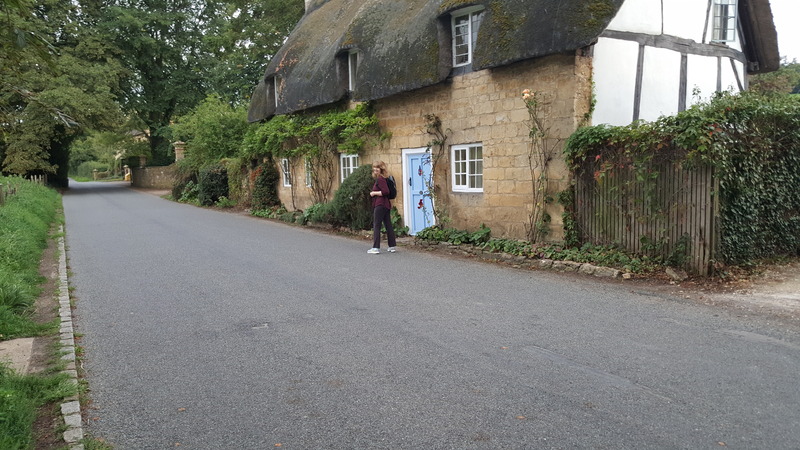 Later in the afternoon we stopped for a cream tea at the Broadway inn and pub. David was not taken with the clotted cream, but we both loved the scones and jam…then it was back to the grocery for more Tin Loaf, and return to Old Orchard. Time for evening cocktails! 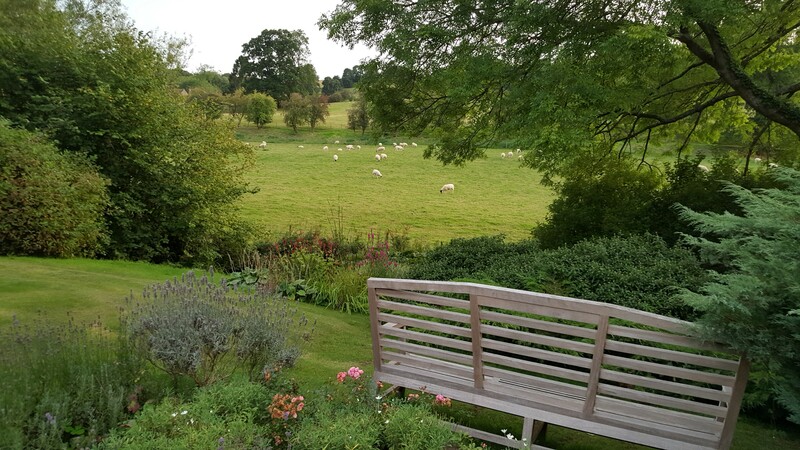 So we sat on the terrace in the rear of the house, looking out over the beautiful grounds with the running brook at the bottom of the garden, beyond to still green fields dotted with the white grazing sheep, and back still further into the setting sun. Well, I thought I’d died and gone to English heaven. 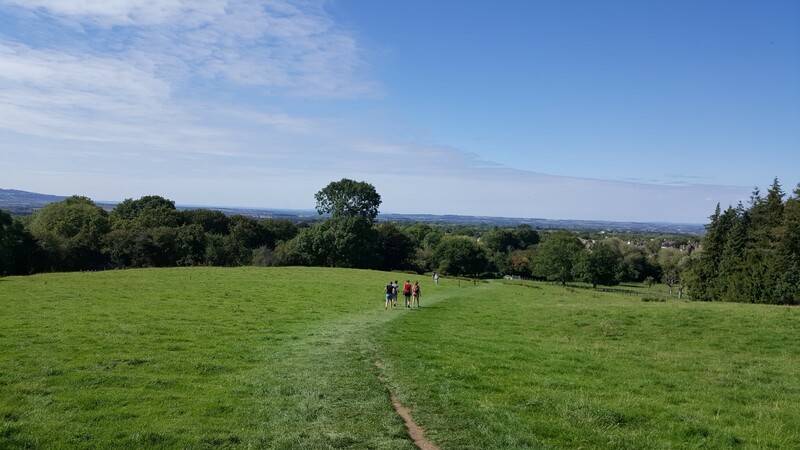 Sunday August 27… Today we decided to find the trailhead for the Cotswolds Way, on the other side of Broadway. 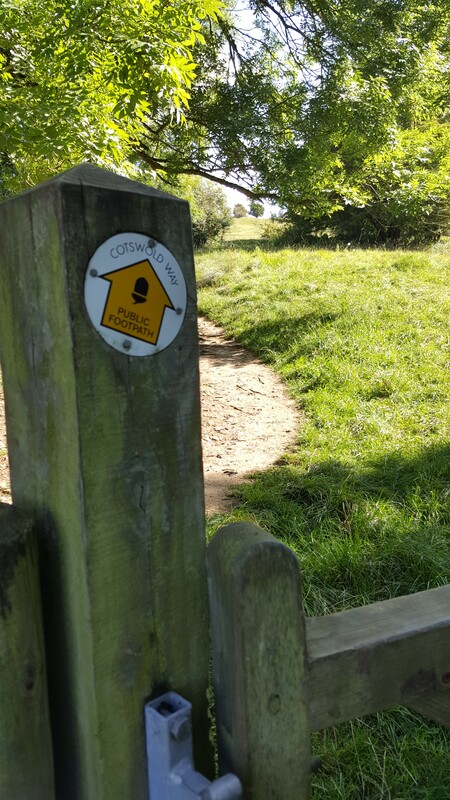 The Cotswolds Way is one of the oldest footpaths in England. It was another gorgeously sunny day, and this part of the footpath was unshaded by trees along the actual trail, so by the time we managed close to a mile, we were rather warm. so we found shade beneath some (I think) beech trees, and unpacked the feast. 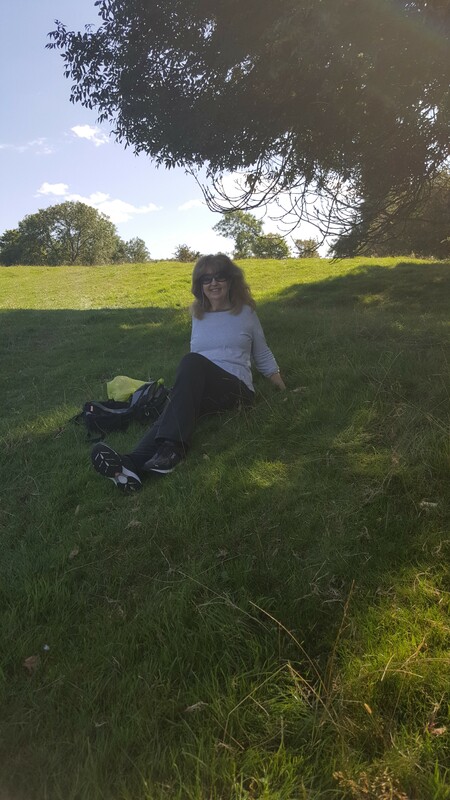 We sat on the grass, looking down into the green valley where Broadway lay, and all the fields and rolling hills around and beyond us. You felt you could just dance over the low-lying hills and fields like a dandelion head blown in the wind. (Obviously not dancing here!) 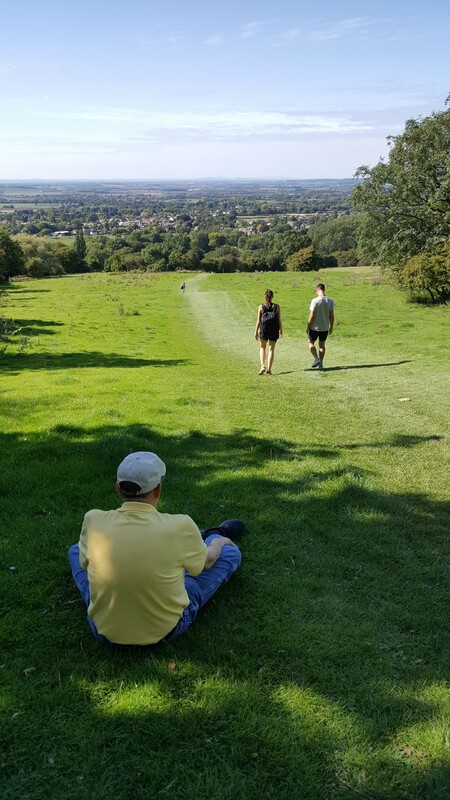 I pulled myself together, and walked over the crest of the hill behind us to see how far it was to the Broadway Tower. 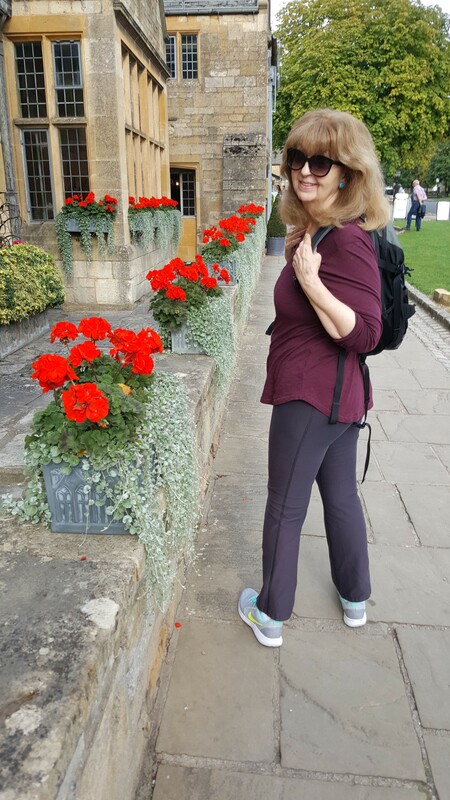 It was at least another mile away, and as I was unsure as to David’s desire to walk any further, we packed up and trotted back down to Broadway. 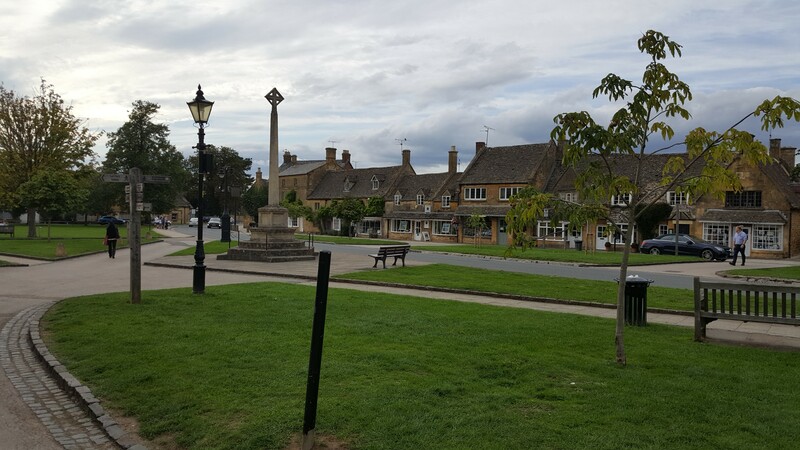 The Horse & Hounds pub came into view, and a half pint sounded perfect, so of course we stopped in to check out their local IPA, then found Lloyd’s Bank for some money, and after that, moved on to the Lygon Arms for the second half pint! After which, we walked to the end of the high street for dinner at a local Indian restaurant…the food was fabulous, but I was absolutely stuffed (no surprise there) and we brought half the meal back to Old Orchard with us. 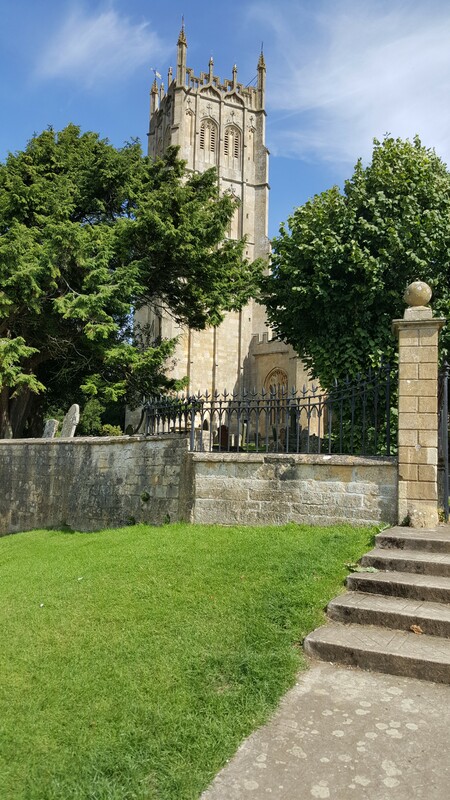 Monday August 28…Today we spent a beautifully sunny (warm!) 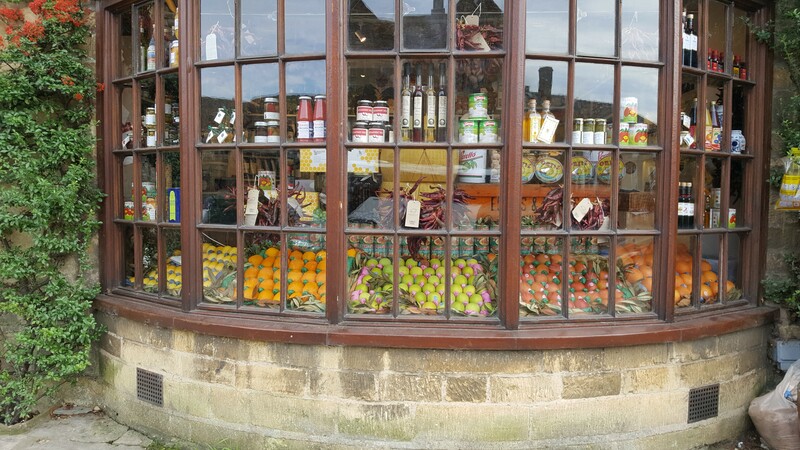 day in Chipping Campden. Steve was busy with a tour, so he sent Roz to drive us there, she was really delightful. She dropped us off at our checkpoint (the willow tree in the town’s center), and told us she’d meet us there at 4PM. 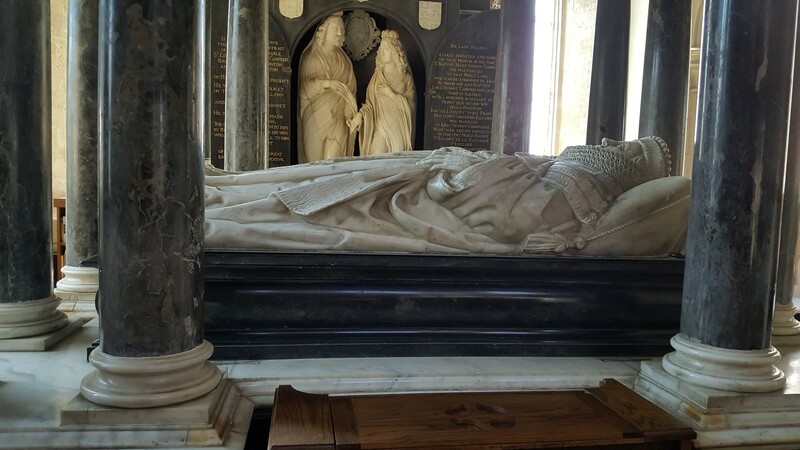 We spent time in the beautiful, historic Church of St James, with its old, old carvings, stained glass and memorials, and wandered outside to take a walk amongst the ancient tombstones. 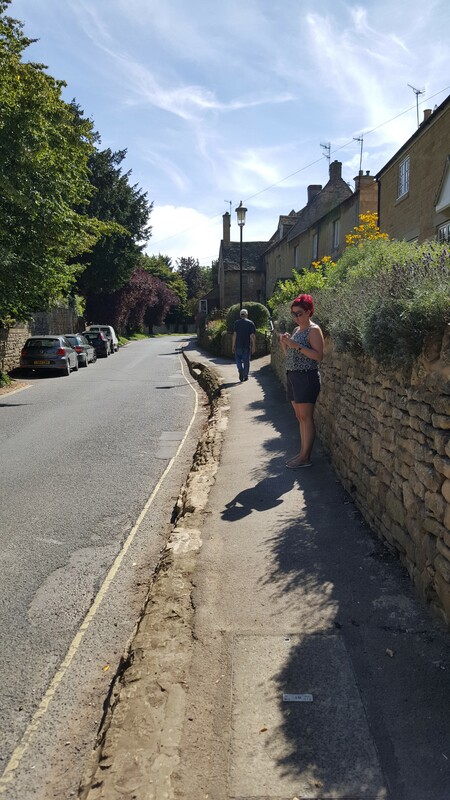 and, further down the road, noted a girl with purple hair; chatted with Peter, an American from Seattle; and had a Ploughman’s Lunch in a teashop. People are so kind here. 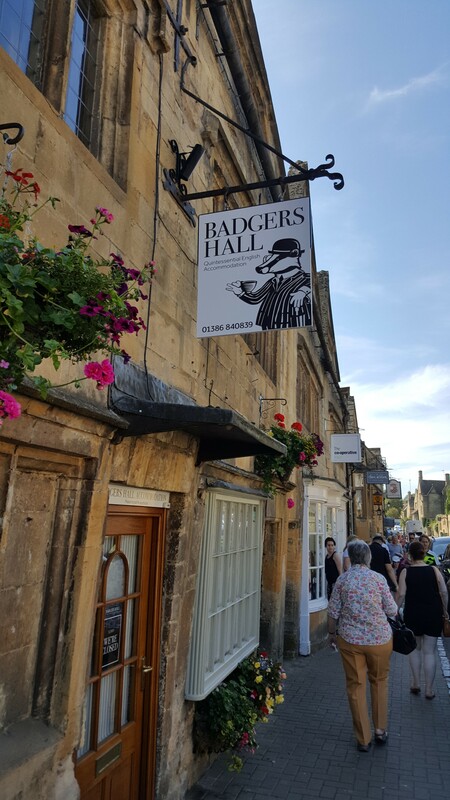 As we were wandering around the town square, a gentleman came up to us to tell us about a lovely little gallery exhibiting photographs and beautifully framed miniature paintings of Chipping Campden in all seasons. We had ten minutes to spare, so dashed inside, where I bought a framed print of a snowy winter’s day in the surrounding fields , which I loved. 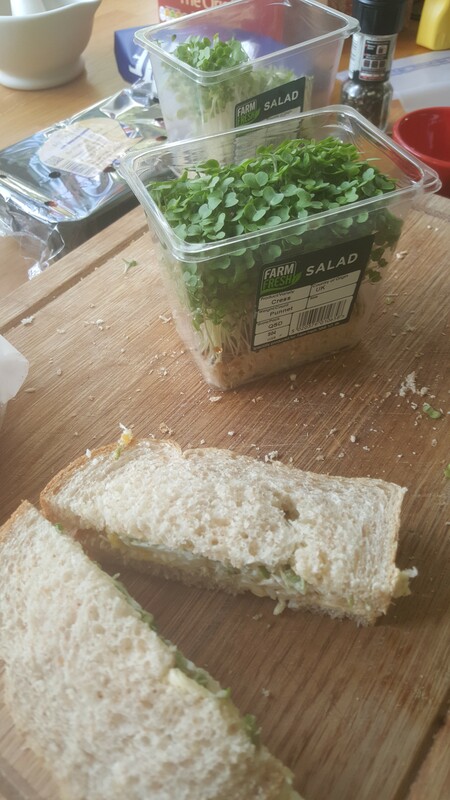 Then we found a grocery store that was open (it was Bank Holiday) as we were in dire need of cheese and ale, and met Roz back at the willow tree. 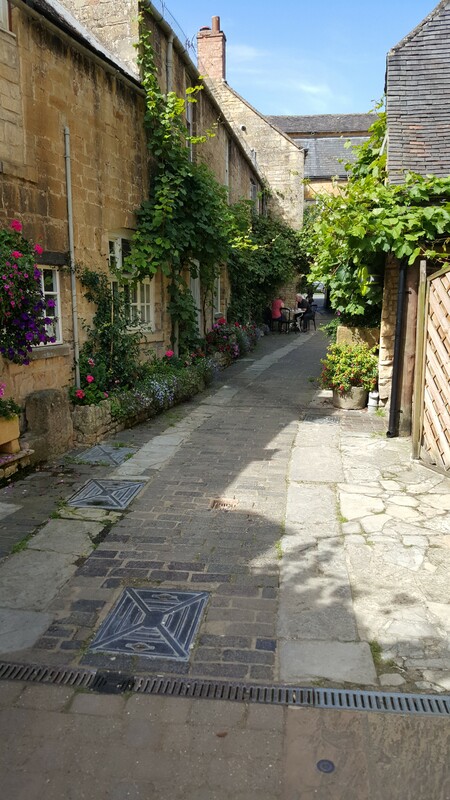 Chipping Campden is absolutely delightful…now I wonder if I can afford to live there?! Posted in Uncategorized and tagged Broadway, Broadway Tower, Chipping Campden, Church of St James, Cotswolds, oldest footpaths in England, Ploughman's Lunch, Royal DoultonOld Orchard, scones, Sheep Street, thatched cottages, The Cotswolds Way, The Cotswolds Way and Chipping Campden - Chapter 3, The English Cotswolds - Broadway, Tin Loaf, watercress. Bookmark the permalink.